"One of the great performances in jump race history." KAUTO STAR VS DENMAN - WHO IS BETTER? Might Bite and Native River's 2018 Gold Cup clash, the Paul Nicholls and Nicky Henderson debate, throw-in the Willie Mullins and Gordon Elliott dispute - all good things seem to come in pairs. Then comes, the Kauto Star vs Denman matchup. Where do we begin? Rewind almost ten years ago to 2009, and to a race like no other. 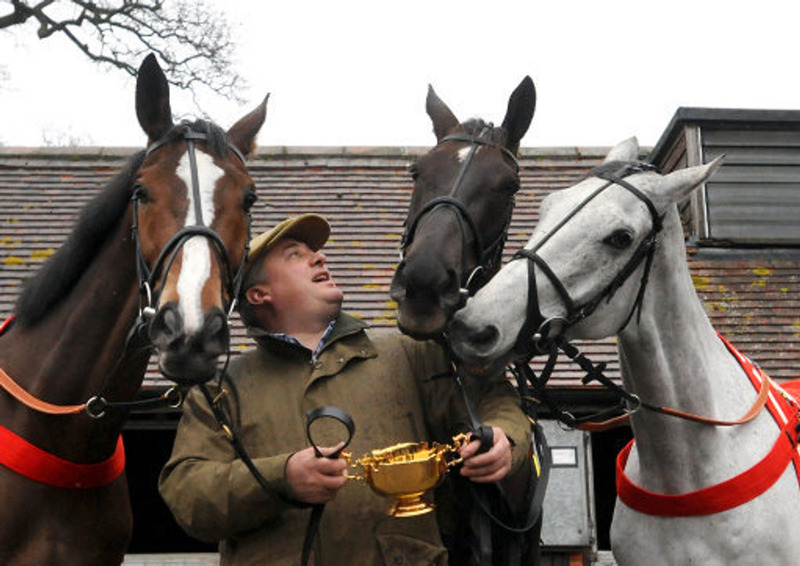 A fascinating stable rivalry had been forming in the years coming up to this, with Kauto Star - many believing him to be the best Chaser of the 21st Century, winning the 2007 renewal of the Cheltenham Gold Cup, before Denman - the young pretender, declared himself the best twelve months later. Away from the Festival, Kauto Star had been running riot in the Betfair Chase - with his fourth victory coming in 2011, along with the King George at Kempton - notching up his record fifth success in the same year. Flamboyant at his best, often a risk-taker, but oozes class. He was nimble, athletic and overall just brilliant. Whilst this was happening, Denman, against all odds, managed to land two Hennessy's (now known as the Ladbrokes Trophy), under the top weight of 11st12, tanking his way through the field - thus giving him is nickname the Tank, along with a whole host of top race successes. As Richard Hoiles said in commentary during his 2008 Gold Cup victory: 'relentless and remorseless'; two words that it would not make sense describing any other horse. The term's heroes, or warriors, and even legends, are also sometimes inexplicably overused. In the first line of this article we referred to Might Bite and Native River's 2018 Gold Cup clash; this was nothing compared to the real matchups between Kauto Star vs Denman. The 2009 Cheltenham Gold Cup - the rematch, was to be the greatest battle of all time, between two absolute giants of the chasing scene. It was Kauto Star and Ruby Walsh that got the better of Denman and Sam Thomas, where he became the first horse to regain the Gold Cup at Prestbury Park. It's clashes like this that you do not see common nowadays; not at all recently, do you see a horse win a Gold Cup, and come back to defend it, let-alone winning it. 2017 Winner Sizing John - trained by Jessie Harrington, followed up with a series of Gold Cups in Ireland but struggled with injury since, and 2016 winner Don Cossack retiring later in the year, proving the form from the Festival Showpiece not being all that strong in recent years. Not even sure where to start with 2015 Winner Coneygree - becoming the first Novice to win the prize for over forty years - and has done nothing since except being pulled up, though he did finally show the spark that led him to that success with a fine run in the Bet Victor Gold Cup. In 2010, the Nicholls duo lined up once again, but unfortunately Kauto Star fell four from the finish, leaving Imperial Commander to lead home Denman. Twelve months later, it was Long Run's turn to taste victory, with Denman and Kauto Star both making the frame, finishing second and third respectively. Denman retired after disappointing at Aintree in 2011, whilst Kauto Star was sadly pulled up in the 2012 renewal of the Cheltenham feature, won by Synchronised. Two legends of the sport, provided us with the best rivalry in the game. Both now gone, but both never ever forgotten.